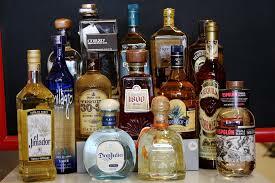 The most feared alcohol behind a bar, everyone has a tequila story. Whether it makes you giggle, makes you crazy or just plain makes you sick, everyone knows tequila. Whether in a shot or mixed in a cocktail, tequila is an essential behind the bar. Many of today’s most popular drinks are made with this agave-based alcohol. Pour Tequila and 7-up or Ginger Ale in a rocks glass. Put a napkin or hand over the top of the glass and slam it on the bar 3 times. Drink immediately. Pour tequila in a highball glass with ice and top with lime and orange juice. Add grenadine by tipping the glass to its side and pouring the grenadine down the inside, making sure it settles at the bottom. The grenadine should rise slowly though the drink, resembling a sunrise. Serve. In a shaker, pour tequila, cointreau and lime. Shake until thoroughly mixed. Pour into a salt rimmed margarita glass. Garnish with a lime. Serve. Fill an old fashioned glass half full with ice, squeeze the lime over the ice and place the lime into the glass. Add tequila and crème de cassis, top with gingerale and stir gently. Mix vodka, gin, rum, and tequila in a tall glass. Add triple sec and sour mix. Splash with cola for color . Serve with a lemon garnish. In a shaker, pour combine ingredients over ice and shake well. Pour into a salt rimmed cocktail or margarita glass. Garnish with a lime wedge. Pour tequila, Irish cream and schnapps into a cocktail glass. Add ice and half-and-half. Pour into a shaker, shake to mix and pour back into the glass. Garnish with a cherry, and serve. Pour tequila and coffee liqueur over ice in an cocktail glass and stir. Add twist of lemon and serve.